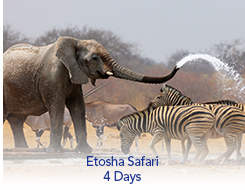 Etosha, “The Great White Place,” is one of Southern Africa’s finest game reserves. It is home to 114 mammal species, 340 bird species, 110 reptile species, 16 amphibian species and one species of fish. The reserve was created around a mineral pan believed to be over 1000 million years old.